Paris, France (November 30, 2015) – Climate-vulnerable countries supported by the Adaptation Fund received good news at the opening of COP 21 on Monday, as the Swedish government pledged an additional 150 million SEK (about US$17 million) to further the Fund’s work. 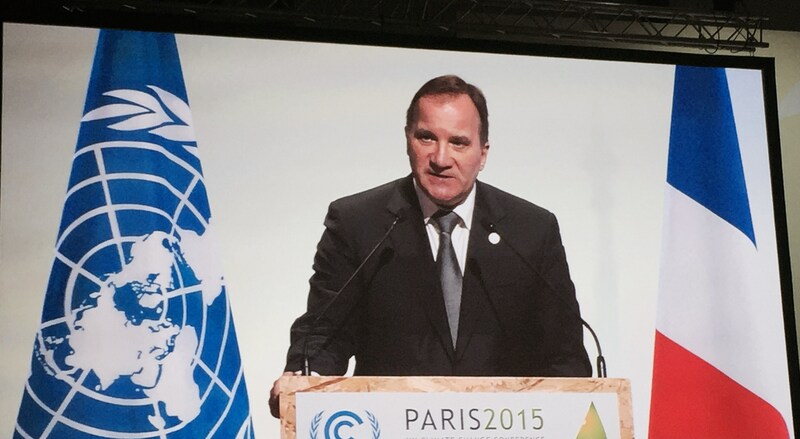 Sweden Prime Minister Stefan Löfven announced the “significant new contribution to the Adaptation Fund” during a High Level Segment speech in the early evening of opening day of COP 21. According to a release from the Swedish government, financing for climate change adaptation is extremely important for developing countries — particularly for small island nations and least developed countries that are already dealing with the consequences of climate change. Implementing preventive measures and adapting societies to climate change are crucial to save lives and safeguard opportunities to earn a living, the release added. The additional support for the Adaptation Fund follows previous pledges to the Fund from Sweden totaling 400 million SEK (about US$45.8 million) as of September. The new support was welcome news for the Fund, which at its current rate of providing support to countries may run out of funds by the end of 2016. The Fund is designed to finance concrete projects in vulnerable communities of developing countries disproportionately affected by climate change. To date, it is supporting 54 countries, including 12 Small Island Developing States and 19 Least Developed Countries across a range of adaptation sectors such as coastal zone management, sustainable agriculture, food and water security. The 21st session of the Conference of the Parties (COP) to the United Nations Framework Convention on Climate Change (UNFCCC) is taking place from November 30 to December 11, 2015, in Paris, France. With 196 member nations, the UNFCCC seeks a binding, universal climate change agreement that stabilizes greenhouse gas emissions at levels that prevent dangerous human interference with the climate system while also helping countries adapt to the effects of climate change already impacting vulnerable populations throughout the world. It is now recognized that adaptation is equally important as mitigation in addressing climate change but requires significant additional resources to meet a growing and urgent demand for climate adaptation projects. The Adaptation Fund is an active participant during COP 21, hosting side events and related activities. The Adaptation Fund was established under the Kyoto Protocol of the UN Framework Convention on Climate Change, and since 2010 has committed US$331 million to support 54 countries. To date, 51 concrete climate adaptation and resilience projects have been approved, with the majority in the implementation stage.